LONDON – It may have been the 10th consecutive year that XL Video has provided support for the Brit Awards, but the 2011 edition was anything but the same-old same-old. For starters, it was the first time the event was staged in London's cavernous O2 Arenas. Then there was Peter Bingemann's set design concept – an "exploded" Union Jack flag, animated with a custom-built video assist from XL Video. XL Video provided LED screens, projection systems, PPU, cameras and co-ordination of the show playback content for the awards program, which featured live performances by Take That, Arcade Fire, Adele, Rihanna, Mumford & Sons, Plan B, Tiny Tempah, Paloma Faith and Cee-Lo Green. XL split the project management duties between Chris Saunders, who oversaw the camera and playback elements (his 17th Brit Awards) and Paul Wood, who managed the screens, projection and specials packages for the various live artists. 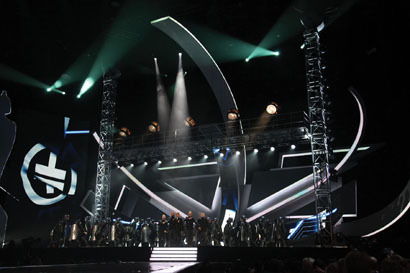 "It was great to be working on The All New Brits, specially in a new venue and with a new format, celebrating some of the best musical achievements of the last year in a show that continues to advance, evolve and push boundaries in technical and presentational goals, this was a stunning show with the emphasis on the musical performance, and it worked," said Saunders. Saunders and Wood both worked closely with The Brits production team, including set designer Peter Bingemann, TV director Phil Heyes, event production including Kate Wright, Maggie Mouzakitis Tony Wheeler, TV Production manager Annie Crofts and lighting designer Al Gurdon. XL supplied all the main elements for Bingemann's set design, including the "St. George's Cross" element, spanning 20 meters in width and 22 meters in height, and made with Pixled F11 screen surface. The set and screen support structures were constructed by Steel Monkey, and XL dispatched the panels for the St. George's Cross element to be pre-built at the Steel Monkey workshop in Bristol. The stage had a long thrust going out into the VIP seating area, with a second stage at the end of it that hosted all the awards, which were presented by actor/writer/producer James Corden and guests. XL supplied more F11 to make up the two main on-stage screens. The first was an 11-by-6-meter landscape-oriented central screen, which flew in and out (downstage of the Union Jack) on a Kinesys automation system between performances. This was used to display all the Awards nomination packages and VT inserts. The second F11 screen, flown stage right in a portrait configuration, was 10 meters high and 5.5 meters wide. XL also provided two 20 by 11 foot I-Mag projection screens for stage right and left, and three 16-by-9-foot projection screens positioned left, center and right for those seated on the O2's top level. XL's gear package also included a GV Kayak HD PPU and two Sony HXC 100 cameras. Live video director Nick Fry mixed this imagery with 12 feeds supplied by host broadcaster CTV and output the content to the I-Mag screens via XL's Barco Encore screen management system. Richard Turner and Richard Burford managed and engineered the playback systems for XL. XL also supplied extras for Arcade Fire and other live acts using four Barco FLM22 22K scenic projectors and a Catalyst playback system, which covered part of the set, plus five square metres of Barco I12 12 mm indoor LED attached to the riser fronts for rapper Tiny Tempah. Hello Charlie supplied content for the Awards elements. Most of the performance playback videos were synched to timecode and stored on two GV Turbo 2 hard drives and virtual VTRs. Sam Pattinson created the footage for Take That's appearance, and Richie Stembridge produced the visuals for Arcade Fire. For the traditional Brits after-show party area, XL supplied 12 Martin LC 2140 40mm LED panels configured into a cube, with live camera playback seen via a Hippotizer media server. For the red carpet area, another focal point, XL supplied 23 square meters of Stealth 25 mm LED in 12 strips and another Hippotizer playback system. "As one of the highest profile events on the British music calendar, we are always proud to be involved in The Brits," said Wood. "The production values are high, the design and presentation is always ambitious and the results very rewarding." For more information, please visit www.xlvideo.tv.